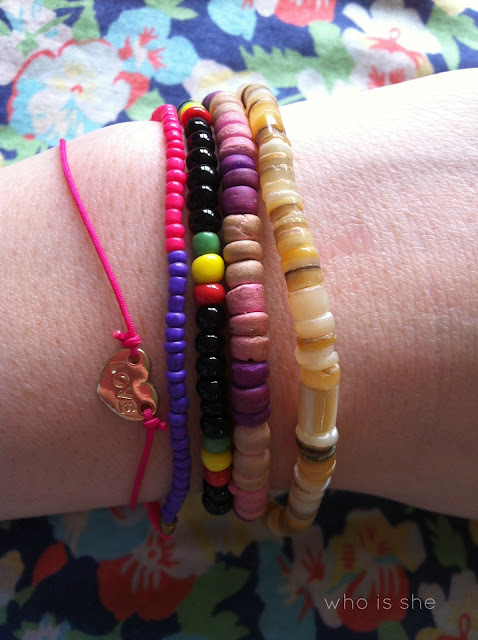 Bit of a different post for you today (even though I'm typing this yesterday to try and take my mind off a job interview) and I thought I would share with you all my current favourite bracelets. I don't wear these all at once, I normally swap and change between them- the beaded bracelets I very rarely wear for nights out as some of them are meaningful and I don't want to loose them. Pink Love Bracelet- I've recently bought from Topshop for £6.50 (how expensive I know), yet its not avaliable online. The Purple/Pink bracelet is currently Topshop's Charity bracelets and came in a set of two- these are avaliable online and instore for £2. Next up are my Jamacian beads which I got off "Tinnie Tempah" in Tenerife with Kayleigh. Then there's my battered Purple/Pink bracelet which I got off my favourite Miget Dave (her actual name is Carole) when I was working in the Co-op about 6 years ago. Finally we have my Zante bracelet which I bought on my first ever girls holiday with Holly back when we were 21. The studded bracelet* is from Oasap and is pratically the same as the Topshop version for a fraction of the price- this is my new favourite item of jewellery. A word of warning though- its very very sharp, could come in hand for nights out when you get unwanted attention from gentlemen. 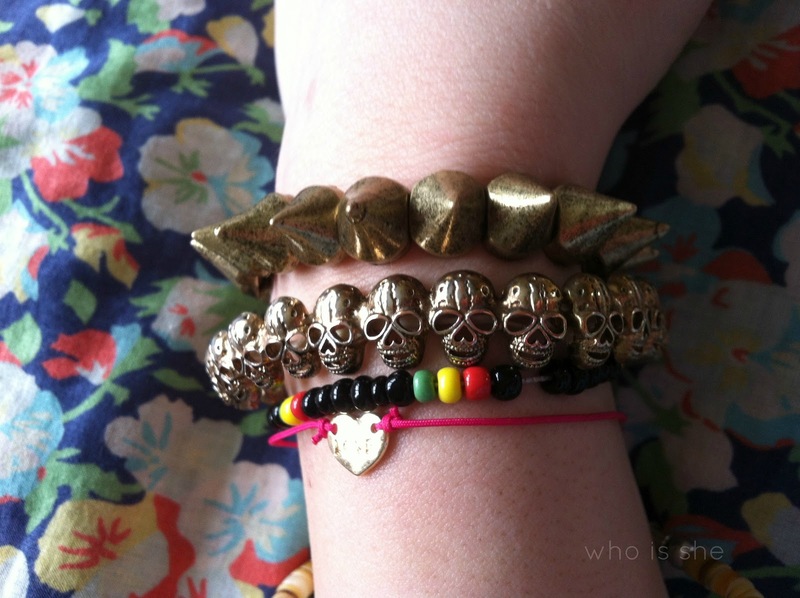 Next up is a bracelet you've seen a thousand and one times on the blog- my skull bracelet from Topshop. I would be heartbroken if this ever broke. I should have also taken a picture of my oversized Asos gold watch (or as Ben calls it my lucky lucky man watch) which you also see on the blog all the time, that very rarely leaves my wrist. What accessories can you not live without? These are all really pretty :) it's nice you have bracelets and stuff that mean something to you. Since I got my Michael Kors (my preeeecious) it rarely leaves my wrist.